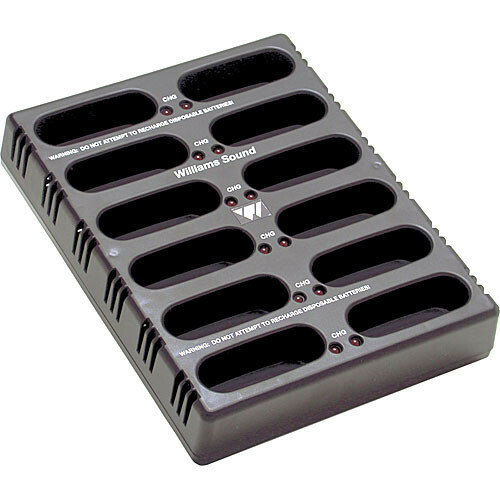 The CHG3512 from Williams Sound is a 12-bay charger designed for use with a variety of transmitters and receivers including the PLR BP1 loop receiver, PPA R37 & R38 receivers, PPA T46 FM transmitter, and the WIR RX22-4 infrared receiver. The rack charges your devices in about 16 hours, keeping them organized and saving you from having to continually replace alkaline batteries. Each bay has its own LED indicator that flashes when charging is complete. The charging system includes the 12-bay unit, a power supply, and a power cord. Box Dimensions (LxWxH) 12.5 x 11.1 x 2.5"